It's just 2 and a half years since Virgin Money Giving launched and donations have already broken through the 100 million pound barrier! Due to the fact that they are a "not for profit" donations platform, an extra 3.4 million pounds has been donated to charity compared to justgiving.com*. It is for that reason that I've decided to make the switch to Virgin Money Giving for all of my future fundraising activity. You can read more about it here on the Virgin Money Giving blog. If you would like to make a donation then please use this link. 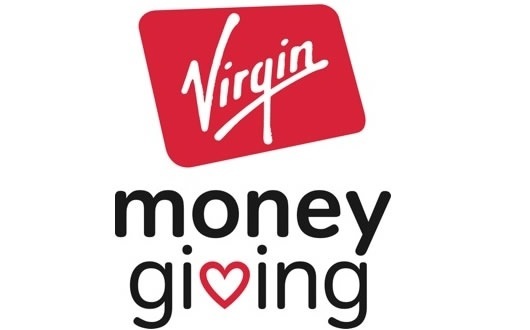 * If the money raised through Virgin Money Giving since launching in October 2009 was raised through JustGiving instead £3.4m less would have reached charities. This is based on the Gift Aid re-claim rate for Virgin Money Giving and the overall mix of payment types on Virgin Money Giving. I'm always looking for new ways to keep the Run Geordie Run profile raised between major events while trying to inspire others to run or do something that makes a positive difference to other people's lives. With that in mind, cue a new series of "inspirational" posters that will be appearing here and there in the build up to Australia 2013. The first one, shown below, proved very popular when it was posted on my Twitter and Facebook feeds. I received some lovely feedback, particularly from the running community and it wasn't long before it had been viewed over 1000 times. 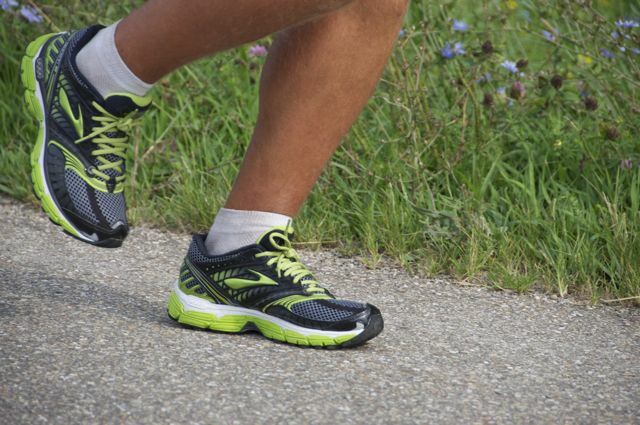 "Cross Country Running" has already appeared in a couple of office premises and a gym. If you would like an A4 sized Run Geordie Run poster to display in your gym, shop or office or if you'd like to include it in your publication then please get in touch at sponsorship@rungeordierun.com. Stocks are limited so please be quick. After weeks of hard work and planning, I can at last say that there is now genuine momentum gathering to make the run across Australia follow in the successful footsteps of the run across the USA. The first major task that was completed was the detailed route plan. I finished that last week and if I didn't know already, I certainly do now that to cross Australia in just 70 days is going to easily be the toughest challenge to date. I've already pinpointed the Eyre Highway, which is over 1000 miles long and links Western Australia and South Australia via the Nullarbor Plain, as the most difficult stretch on the run. 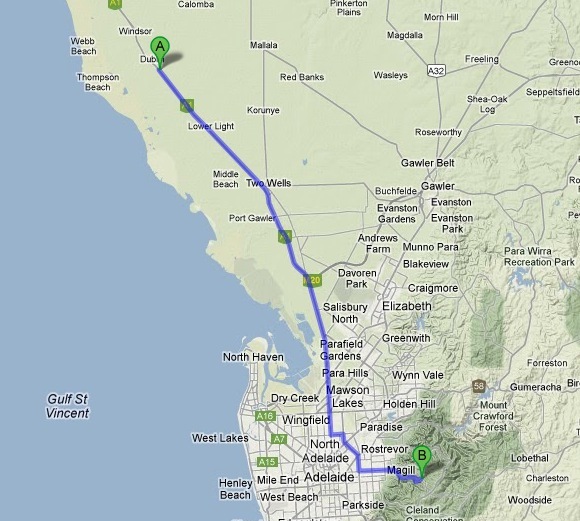 There is one stretch of the Eyre Highway which is the longest straightest section of road in the world at 91.1 miles. Given the harsher temperatures and lack of facilities and general population, it's set to make the 1000 mile long stretch of Highway 36, on my USA 2011 route, look like a walk in the park. 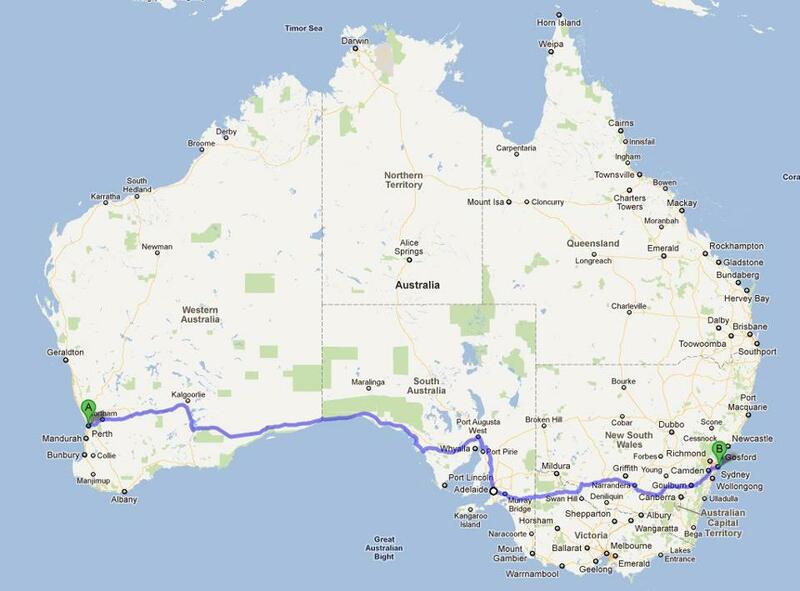 With a punishing schedule of 41 miles per day with 3 full rest days, it's going to take 42 days to run 1600 miles from Perth to the outskirts of Adelaide. Day 43 (27th November 2013), which is the day before my son's birthday and the day before rest day 4, will see me run 43 miles from the north and then through Adelaide before finishing with a gruelling 1000ft climb up to Norton Summit to the east of the city ((B) in the image blow). Following that rest day on day 44, it will take a further 26 days to run the remaining 1000 miles to Bondi Beach in Sydney. I aim to arrive on Bondi Beach, after running past Sydney Olympic Park and quite literally over Sydney Harbour Bridge, live on Real Radio on the morning of Christmas Eve (UK time). If it's only half as dramatic as the finish that I had in the USA then everyone is in for a treat. Away from the route, I have put a lot of effort in over the last month to try and secure a headline sponsor. I had the final of 3 meetings with a potential company this week. I gave a 90 minute presentation to the company that, in their words, "hit the spot". I hope to have positive news over the next few weeks on this front but with 2 other potential suitors waiting in the wings to hear my story I'm quietly confident of securing the funding needed to carry out the tour across Australia. I spent £15,000 of my own funds to cross the USA. With a return of over £105,000 for St Benedict's Hospice and The Children's Foundation it was well worth it. The 70 day tour across Australia is going to cost a little more than the 100 day tour across the USA. Flights, fuel and RV hire costs are the main reason for this. After 17 years of self funding, I can no longer afford to stump up the cash myself. Without commercial sponsorship the run across Australia and those I have planned thereafter will be very difficult to execute. 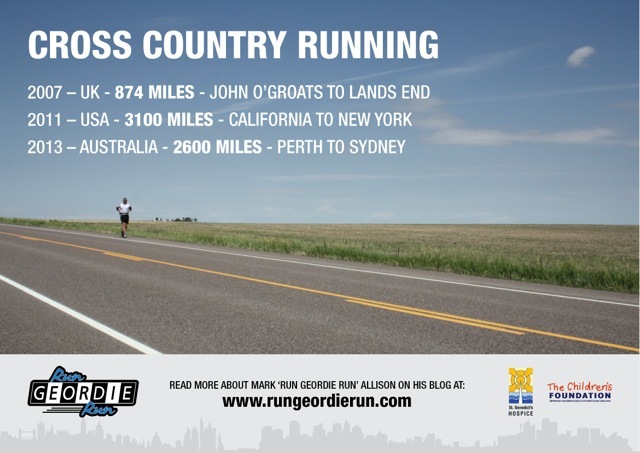 Without commercial sponsorship, it will probably mean that I will have to run unsupported across Australia. I'm no Bear Grylls by any means so I can see that particular method ending badly. I'd give it a shot though! Between major events, keeping the profile of Run Geordie Run raised, as well as that of the 2 charities is always a challenge. I've written articles recently for Men's Fitness and will be featuring in the Runner's World Hall of Fame very soon. I've also started working with Sky Tyne & Wear, a new online only news service. Watch out for video blogs appearing on there from time to time. In conjunction with The Children's Foundation, work has started on the "Run Geordie Run Junior" brand. We are in the inception stage at the moment, but this could be a really exciting legacy to leave if we get the ingredients right. The aims of the project are to work with schools and youth sport's organisations promoting health and fitness with an anti-bullying message. I'm very excited to announce that the special Run Geordie Run menu at Firenze in Jesmond will be "going live" this month too! In conjunction with my mentor, David Fairlamb, I've spent a fair amount of time over the last few months researching a particular nutritional framework. I'll be putting this into practice from next week. Watch this space as to how I get on with that. The 2012 training schedule has been completed this week. I have 2500 miles left to run over the remaining 43 weeks of this year. I somehow have to find the time to get into the gym too with core strength work high on the priority list. I've got some brilliant training runs planned for the Summer. I'm going to get re-acquanted with the difficulty that the North Pennines have to offer. I've also pinpointed the London Marathon, Coastal Run and North Tyneside 10k and Brampton to Carlisle for PBs this year. As ever, the training is going to be full on. It's imperative that I get the nutrition right too. I can't go into the run across Australia at the same weight that I did across the USA. Getting the food right has always been very difficult for me. Run across a continent. No bother. Eat properly. Seemingly impossible! As I said at the start of this blog post, there is now genuine momentum gathering to make the run across Australia follow in the successful footsteps of the run across the USA. I have been doing this kind of planning, preparation, training, fundraising and publicising for as long as I care to remember. Marathons, coast to coast runs, John O'Groats to Lands End, across the USA and now, this is just the start, for the run across Australia. 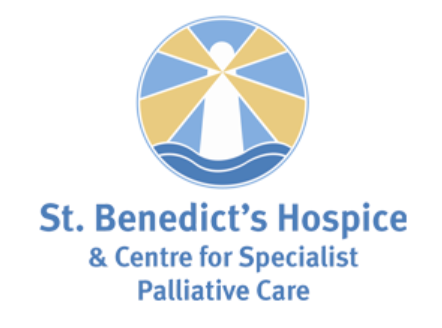 My mission, though, continues to be a simple one; to repay the debt of gratitude to St Benedict's Hospice (Charity No. 1019410) for caring for my Mam and to help The Children's Foundation (Charity No. 1000013) to improve the happiness, health and safety of children, like my own, in the North East of England.